The family of missing pilot David Ibbotson have said they don’t want him left “out there on his own”. 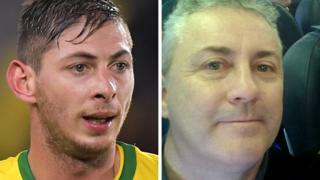 Mr Ibbotson, from Crowle, Lincolnshire, was flying Cardiff City’s Emiliano Sala from Nantes to the UK when their plane crashed near Guernsey on 21 January. The footballer’s body was recovered from the wreck on the seabed, but Mr Ibbotson’s body has not been found. An inquest for Sala will open at Bournemouth Coroner’s Court at 13:30 GMT. A fundraising appeal to fund an underwater search for the pilot has seen about £150,000 donated. Mr Ibbotson’s daughter Danielle told ITV’s Good Morning Britain she repeatedly rang his mobile phone when told by police the aircraft was missing. “He was amazing, I was so lucky to have him as a dad. I know it might take a long time but I don’t want this to just be it,” she said. Ms Ibbotson said she wanted a search team to “just to go down and have a last look, a proper look”. The pilot’s wife Nora added: “We’re still holding on a little bit. Obviously we do know he’s gone but we want him back. France and Paris St-Germain striker Kylian Mbappe has donated £27,000 to the appeal to find Mr Ibbotson’s body. The light aircraft was en route to Cardiff when it crashed two days after Argentine striker Sala’s £15m transfer was announced. An initial search for the missing footballer and Mr Ibbotson was called off on 24 January. However, following calls for it to continue from stars including Lionel Messi and Diego Maradona, a private search funded by online donations was launched. It led to the discovery of the Piper PA-46 Malibu aircraft and a body, formally identified as Sala. The aircraft remains 220ft (67m) under water, 21 miles (34km) off Guernsey in the English Channel. Proudly powered by WordPress	| Theme: aipress by Author.